The best way to get to know a community is by scheduling a tour. See the facilities, meet the staff and residents, and get a feel first hand what it's like to live at The Suites Assisted Living Assisted Living. 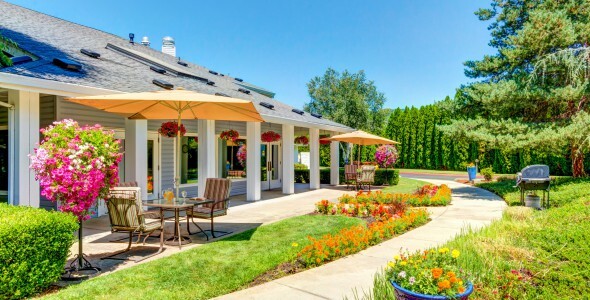 As a traditional-style assisted living community in beautiful Grants Pass, The Suites Assisted Living Community is proud to offer caring and compassionate assisted living accommodations and service to Southern Oregon seniors. Our community is centrally located in the heart of town near shopping, parks, highways and the banks of the Rogue River. The Suites Assisted Living Community is a part of Frontier Management. At Frontier, our mission is to enrich the lives of our seniors through our programs, environments, communications and commitment. Our residents enjoy their choice of 81 apartment units in a selection of studio and one-bedroom floor plans. All apartments feature private bathrooms, handy kitchenettes and emergency call systems for added safety and security. Private residences also receive weekly housekeeping and linen service. Seniors may participate in a robust schedule of regularly planned activities including movie nights, exercise classes and trips to local attractions. They can also be found working on a craft project in our activities center, exploring the grounds along our many walking paths or getting their hair done in our on-site beauty parlor. To help our residents make the most of out their retirement, The Suites Assisted Living Community employs 24-hour staff who are always available to assist with basic daily activities such as dressing, grooming and managing medications. Each resident has their own personal care plan and all services are provided within the privacy of an individual's apartment. Three times a day, residents gather in our formal dining room to enjoy a hot meal prepared on site by our very own chef. Dishes are crafted from fresh, seasonal ingredients and include everything from side dishes to dessert. Snacks and beverages are available all day for a treat between meals. The Suites Assisted Living Community welcomes Oregon seniors to come and experience assisted living at its finest.